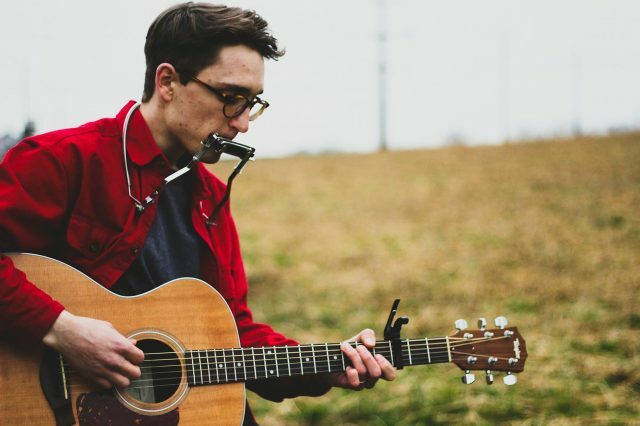 Andrew Pauls, a 2017 Goshen College graduate, returned to town to perform at Goshen Brewery Company (GBCo) last Sunday, Feb. 17. He played a two-hour set. Usually, Pauls performs in Lancaster, Pennsylvania, where he lives with his spouse. His music can be described as folk or bluegrass. During his event at GBCo, he played the acoustic guitar and harmonica while singing. While at Goshen, Pauls also began playing in the “Theory Expats,” a folk band consisting of fellow GC students Ethan Setiawan and Sadie Gustafson-Zook. This band has completed two tours (2015 and 2018). Landon Weldy, a senior, attended the event. Pauls’ show did not just attract audience members from within town. Several recent graduates of Goshen College, many of whom knew Pauls while still in school, returned to GBCo to hear him perform. “In addition to listening to great music, it was fun to catch up with people that have graduated from Goshen,” Weldy said. Pauls has released a couple albums of original music, from which he played on Sunday evening. While singing, he told stories about where he got the inspiration from for certain songs. This allowed the audience to get involved.